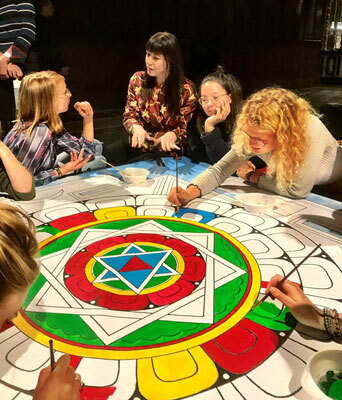 More than 100 Visitors joined in painting this mandala during Museum Night! 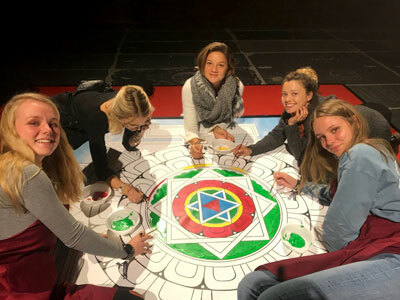 Some years ago, Carmen painted the special Mandala of the 5 Elements, a mandala that consists of the elements of Earth – Water – Fire – Air – Space, that you see below. 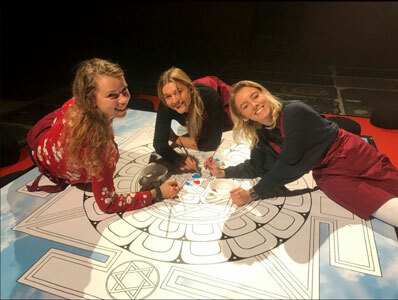 The Nieuwe Kerk (New Church) on Dam Square in Amsterdam (in the heart of the historical city centre) asked Carmen Mensink to create an event for Museum Night, and she thought that it would be great to create a large (2x2m) version of this special mandala, with the visitors that walked in during Museum Night. After a lot of preparation in the weeks before the event, Carmen and her assistant Roméo set everything up in the choir of the church in the day time. The mandala was set up in between the two wishing trees by Yoko Ono, where people could write a wish on a small piece of paper and hang it in one of the trees. 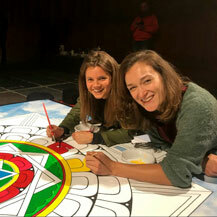 When the doors of the New Church opened at 7pm for the start of Museum Night, the first visitors that stood in line were very happy to make a start with the mandala, and started to paint from the center, going outwards. More and more people joined. Some joined us and painted for 5 minutes, others stayed for hours. 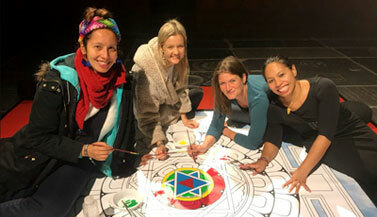 During the hours of Museum Night, besides guiding the painters, Carmen explained all the backgrounds and meanings of this particular mandala. The basis of the old Indian Ayurvedic Medicine was formed by these 5 elements of fire, earth, air, water and space. Later on, this system was incorporated in Tibetan Medicine. These five elements and their energies also live within ourselves. They are connected to our chakras and also correlated to emotions, body types, illnesses, thinking styles, and character for example. 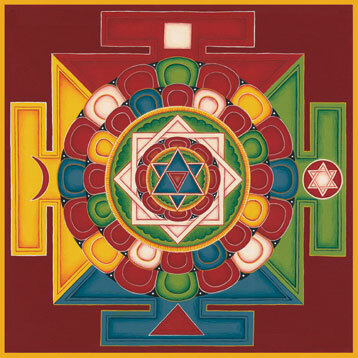 Furthermore, the colors that are used in this mandala are the colors of the 5 Buddha Families. and each color has deep symbolism. 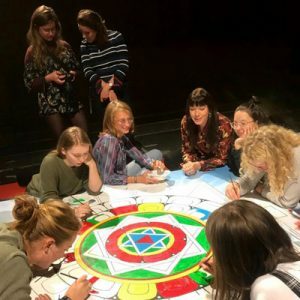 And as the evening slowly grew into the night, and more and more visitors put in their joy and effort, the mandala came more and more into existence. 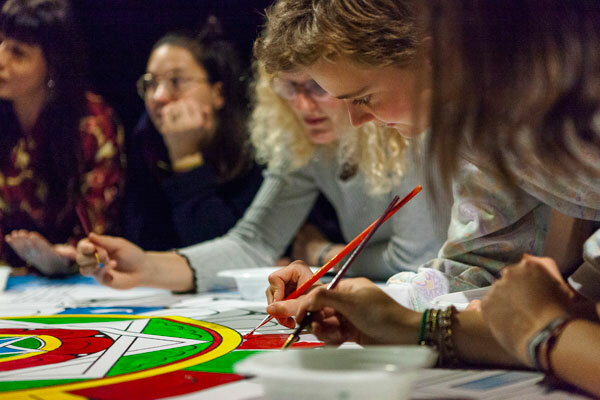 Through Carmen’s information and the lovely vibe, visitors started to have lively conversations together, while working on the mandala. 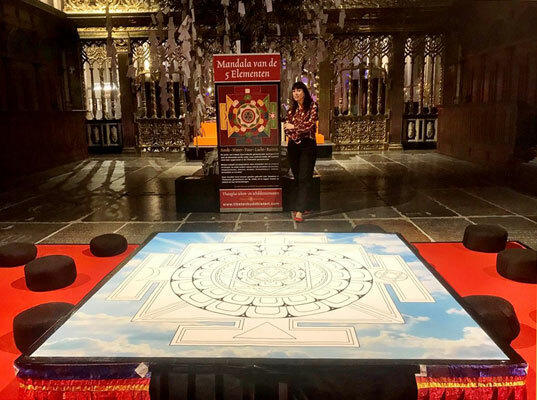 She furthermore explained that this particular mandala was used centuries ago by Nepalese and Tibetan doctors (a doctor practicing Tibetan Medicine is called amchi) to explain the relationship between the diseases and their treatments. 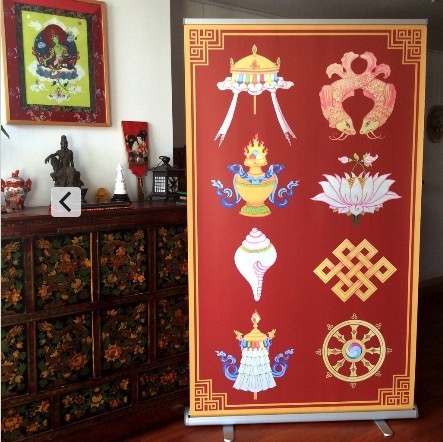 This thangka -if you compare it to other Tibetan mandalas- is a very simple one. 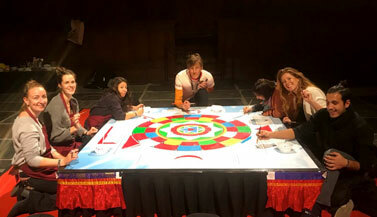 It’s a copy of Carmen’s teacher Andy Weber’s Five Elements thangka, which is in turn a copy of a Nepalese mandala from the 16th Century. When it got closer to the end of the evening (2am) the final touches were painted, such as some shading effects (see left and right picture above). 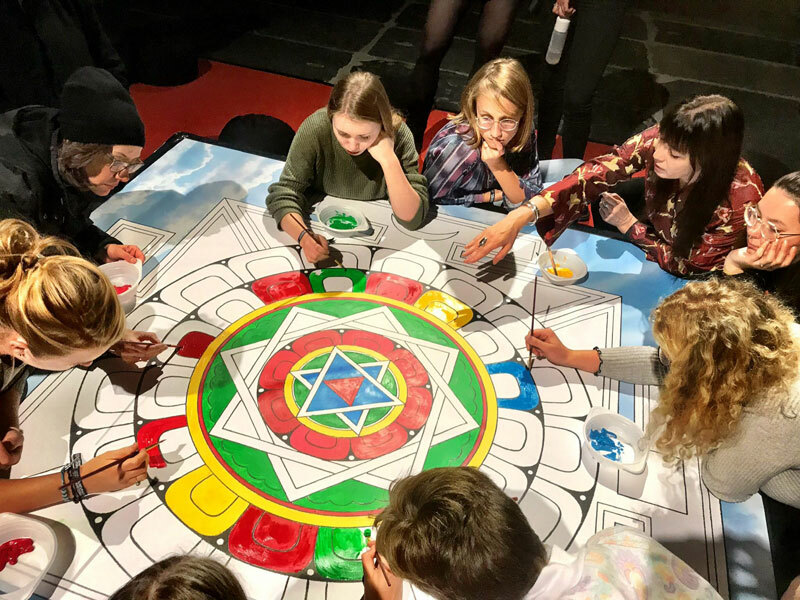 The Amsterdam Museum Night 2018 was an incredible night, where people met each other over art, meditation and wonderful conversation. 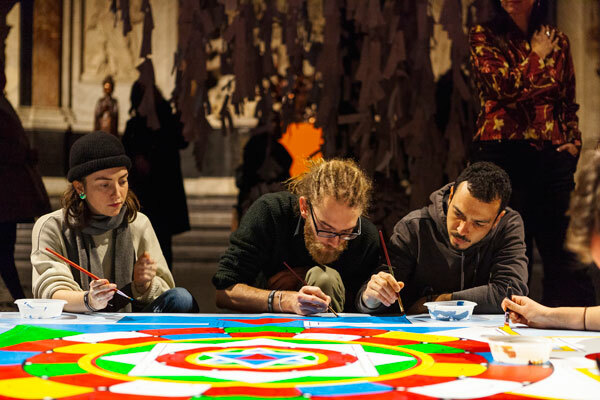 Want to learn how to draw or paint a Tibetan Mandala or a Buddha yourself? 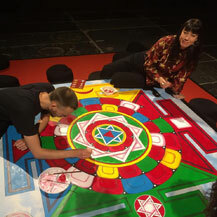 The Mandala is still on view! 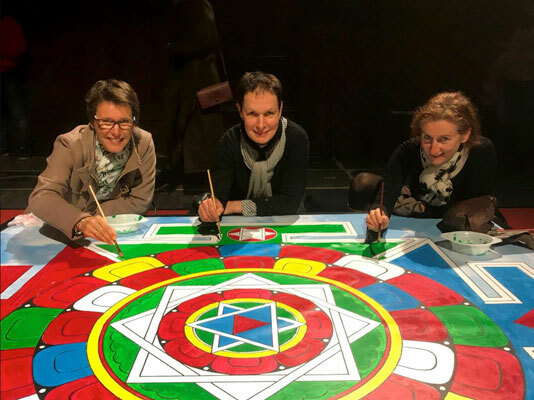 This large Mandala of the 5 Elements, that carries the joyful energies of over 100 people, is still on view at the exhibition ‘The Life of Buddha, Path to the Present’, in De Nieuwe Kerk on Dam Square (right in in Amsterdam’s city centre), until Feb 3, 2019. In this exhibition, more than sixty works of art, both old and new, have come together spectacularly in De Nieuwe Kerk. You can admire a wealth of millennia-old objects and modern artworks by, among others, Ai Weiwei and Yoko Ono. The oldest object dates from the third century, the youngest from 2018; and a few works of art have been made especially for this exhibition. 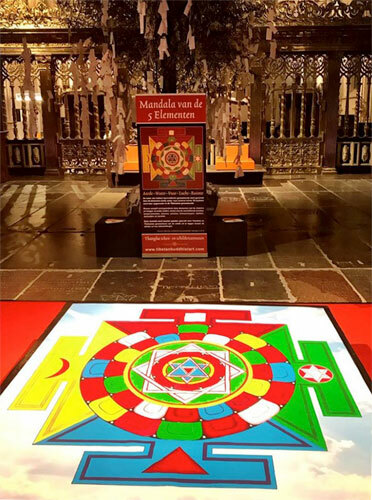 When you visit the exhibition, Carmen Mensink’s Tibetan Mandala artwork can be found in the choir of the church, in between the wishing trees of Yoko Ono. 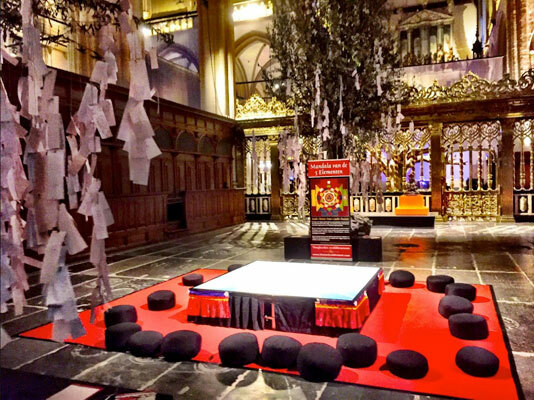 On Saturday September 15, 2018, His Holiness the Dalai Lama opened the exhibition ‘The Life of Buddha, Path to the Present’ in De Nieuwe Kerk (the New Church on Dam Square in Amsterdam). 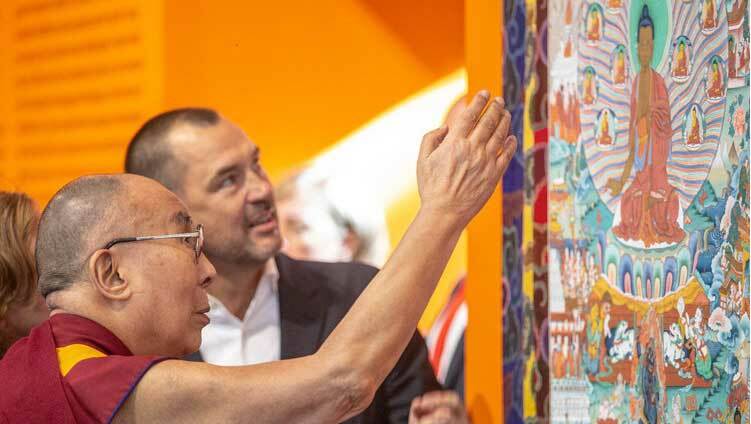 The Dalai Lama looking at his personal thangka of Buddha Shakyamuni surrounded by scenes of his life, that he loaned to this exhibition. 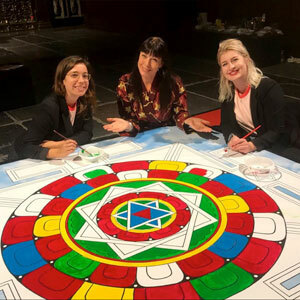 For the previous visits of His Holiness the Dalai Lama to The Netherlands in 2009 and 2014, according to the Tibetan Buddhist tradition, thangka painter Carmen Mensink was asked to create large paintings of the 8 Auspicious Symbols to welcome this special master in her country. 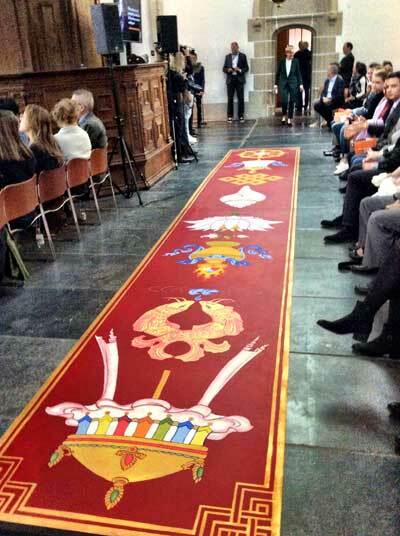 For his visit to Amsterdam and Rotterdam in 2018 she was asked for this again -a very big honour. 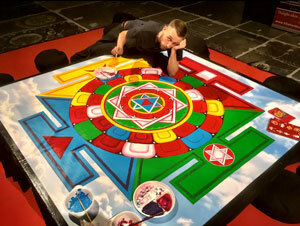 Check out the Making Of pictures of this artwork! HH the Dalai Lama walks over the 8 Auspicious Symbols while greeting different visitors, who are waiting with a white kata (blessing scarf) in their hands to pay their respect to him. 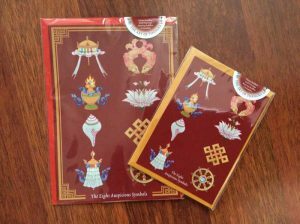 The cards that were made from this artwork can be ordered in the Thangka Cards & Bookmarks section of the Thangka Art Shop (that will soon be renewed). 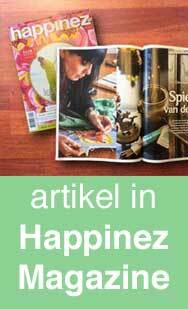 They can also be bought during the Thangka courses & Workshops that Carmen offers. Larger discounts are possible when ordering larger amounts. Special prices for resellers. Seated under contemporary artist Ai Weiwei’s artwork ‘Tree’ (2010), HH. 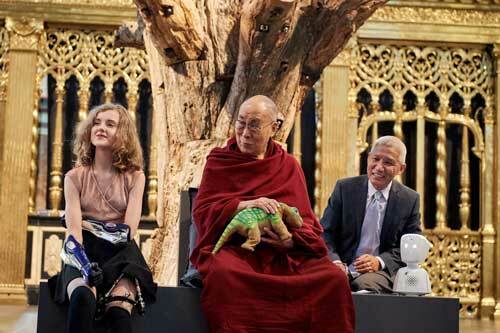 the Dalai Lama participated in a dialogue on Compassion and Technology. 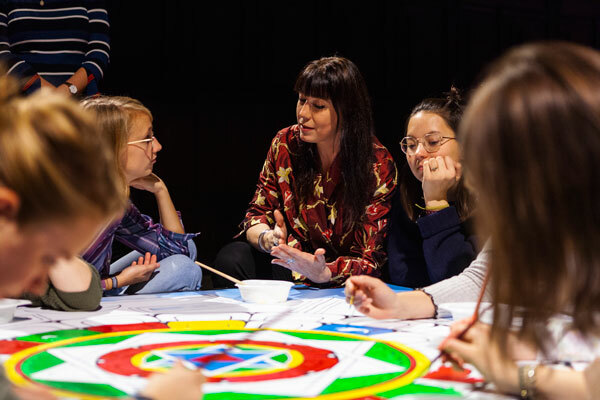 He spoke with young people, technological innovators and scientists, including Faculty Members of content partner SingularityU The Netherlands, and with robot AV1. 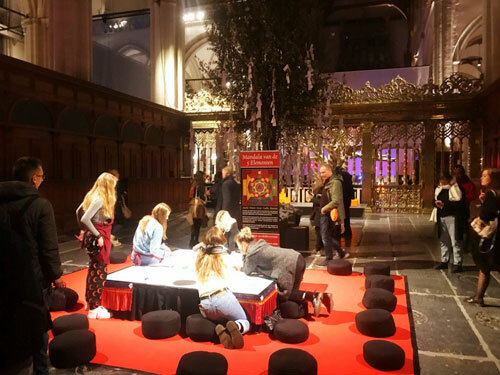 The dialogue, organized by De Nieuwe Kerk and SingularityU, formed the ceremonial opening of the exhibition ‘Buddha’s Life – Path to the Present’. The tree of Ai Weiwei is made from old trees in China, a country that is currently undergoing huge urban transformation. In this way he tries to preserve history. 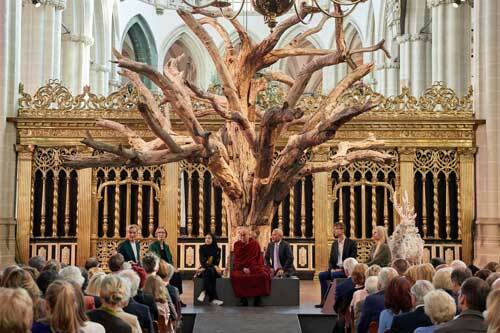 In the exhibition it refers to the tree in Bodh Gaya under which Siddhārtha Gautama, the Buddha, found enlightenment, the highest state of consciousness. 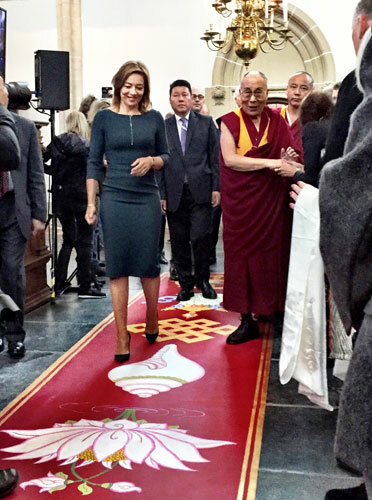 After this excited morning at the Nieuwe Kerk in Amsterdam, Carmen and Romeo had to immediately pack up the artworks and travel to Rotterdam, to install the red carpet artwork in the private quarters of His Holiness the Dalai Lama at the Ahoy Convention Center, where he would be welcomed by and walk over the Eight Auspicious Symbols for the next two mornings as well. 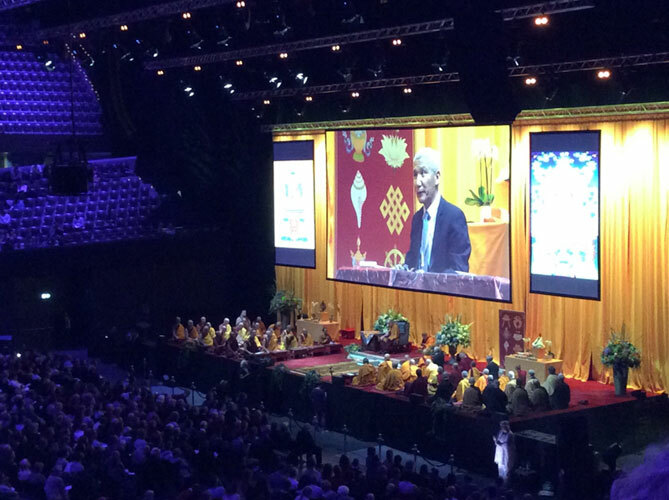 HH the Dalai Lama offered several talks and teachings on Sept 16 and 17, 2018. 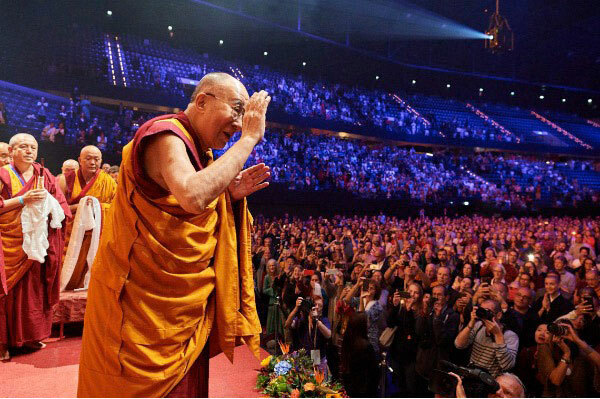 The day ended with a film screening of ‘The Last Dalai Lama’, directed by Mickey Lemle, about His Holiness’ interest in research into methods through which we can learn to understand our emotions. 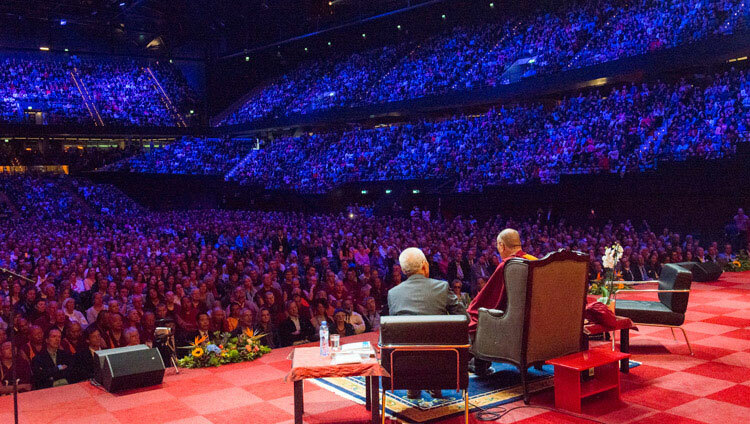 12.000 people attended the teachings in Rotterdam. On Monday morning, September 17, HH the Dalai Lama offered a Buddhist teaching on Langri Thangpa’s text ‘Eight Verses for Training the Mind in Compassion.’ This text gives a clear explanation of how to develop and practice compassion. Carmen’s 8 Auspicious Symbols are featured on stage and on screen. 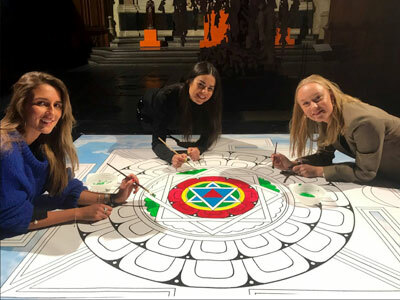 She designed a banner of the symbols for the stage, as the original red carpet painting was installed backstage, at His Holiness’s private quarters at the event hall. At her booth during this event, Carmen sold her thangka paintings, thangka cards, bookmarks and stickers, as well as Tibetan and Nepalese jewelry and other precious items. 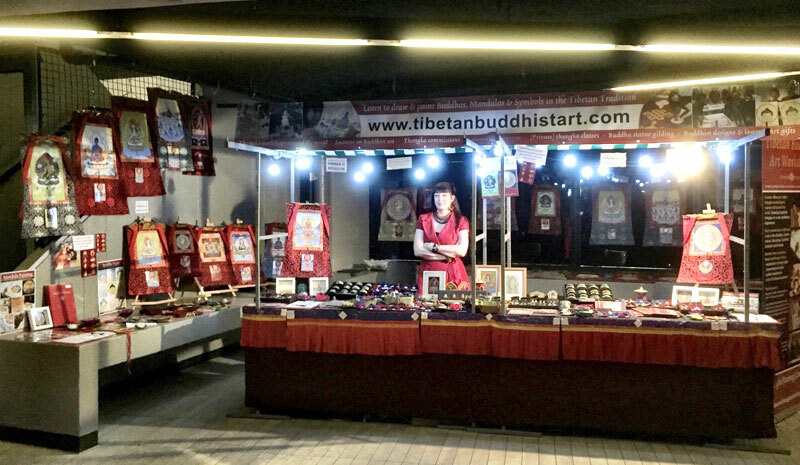 During these two days she raffled 3 thangka workshops to people who signed up to the Tibetan Buddhist Art Newsletter. 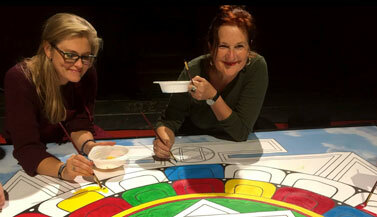 Want to learn how to draw or paint a Tibetan Mandala or a Buddha?